Topics: Tuckpointing, Brick Masonry, Fireplaces Chimneys, Concrete Restoration, Caulking Sealants, and Plastering. It is hosted by Hostway Corporation (Illinois, Chicago,) using Apache/2 web server. 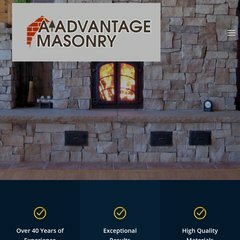 Aadvantagemasonry.com's server IP number is 64.26.63.23. Its 2 nameservers are a.dns.hostway.net, and b.dns.hostway.net. PING www. (64.26.63.23) 56(84) bytes of data. A time of 11.4 ms, is recorded in a ping test.